"This book's comparative approach and exciting insights should prove influential both inside and outside Qing history; serious students of cartography, ethnography, and empire cannot afford to overlook developments in Qing China or this book." 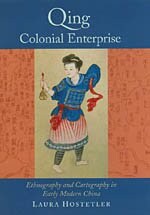 - C. Pat Giersch, Journal of Asian Studies"
In Qing Colonial Enterprise, Laura Hostetler shows how Qing China (1636-1911) used cartography and ethnography to pursue its imperial ambitions. She argues that far from being on the periphery of developments in the early modern period, Qing China both participated in and helped shape the new emphasis on empirical scientific knowledge that was simultaneously transforming Europe—and its colonial empires—at the time. Although mapping in China is almost as old as Chinese civilization itself, the Qing insistence on accurate, to-scale maps of their territory was a new response to the difficulties of administering a vast and growing empire. Likewise, direct observation became increasingly important to Qing ethnographic writings, such as the illustrated manuscripts known as "Miao albums" (from which twenty color paintings are reproduced in this book). These were intended to educate Qing officials about various non-Han peoples so that they could govern these groups more effectively.Hostetler's groundbreaking account will interest anyone studying the history of the early modern period and colonialism.